RRB Malda Admit Card 2018: according to the latest details available, the Direct Link to download the RRB Malda Admit Card for ALP, Tech-3 (Aug Written Exam) has been announced at the official website of RRB Malda. RRB ALP/Tech III Exam is going to be start from 09-08-2018 and will continue till 31-08-2018. Candidates going to participate in the examination may download their RRB Malda Admit Card 2018 either by visiting the official or using the below given links. To collect more information regarding RRB Malda Admit Card 2018 and ALP/ Technician Exam Pattern, you are suggested to check this page which is well designed by the team members of www.privatejobshub.in for your comfort. Appliers who have successfully applied for the RRB Malda Recruitment 2018 and want to get RRB Online Admit Card without any obstacles, then they may follow provided procedure. After reaching on home page aspirants need to select and hit “E call letter download for CEN 01/2018” link to get the Railway Recruitment Board Admit Card. 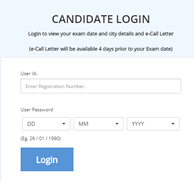 Aspirants are required to enter User ID and Password hit on login/ submit button for RRB Malda Admit Card. Within few seconds, RRB Malda Hall Ticket will appear on the screen. Candidates can check their name first and further go through details from RRB Admit card 2018 Malda . At last, download RRB Exam Call Letter/ RRB Malda Call Letter and must bring the hard copy of it at the time of the Document Verification. Instructions regarding RRB Malda Exam. While appearing for the RRB Malda Exam Centre, you have to bring underneath essentials with themselves. Applicants, going for RRB Malda Recruitment exam may download the RRB Malda ALP Admit Card 2018 through this Official Link. Applicants may also subscribe mail address through web- portal of www.privatejobshub.in to get direct mail regarding Railway Recruitment Board Exam Admit Card/ RRB Malda Admit Card 2018 in your mail box from our free mail service.